Have you ever looked at the myriad of recipes and photos dedicated to gorgeous baked goods that are available online (thanks Pinterest and Instagram) and wished, even a little bit, that you could whip up something equally spectacular? We say that you can! The truth is great baking is a combination of science and art; with a lot of practice, the right tools, and some handy advice, you are bound to be baking like a pro in no time. Here are 10 must-have tips on how to make a great first impression as a baking newbie. 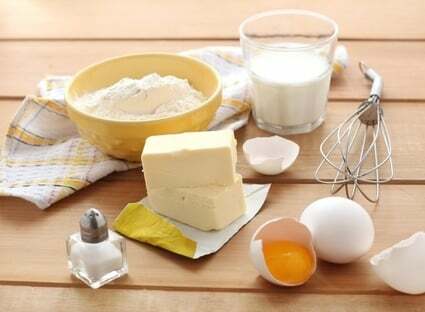 Whether cooking or baking, nothing sets in panic as quickly as realizing that you do not have all the ingredients you need for your recipe– especially when the realization sets in after you have already started to pour ingredients into a mixing bowl! In cooking this might not be such a big deal. I mean, who cares if you leave out a sprig of rosemary from a stew? No, the dish might not taste quite as good, but the meal will go on. A missing ingredient in baking, however, is quite a different story and will, quite literally, be the difference between a masterpiece and a flop. So with that in mind, be sure to read through the entire recipe before getting started, and make sure that you have all the correct ingredients and in sufficient quantities to complete your recipe. In addition to making sure that you have all the ingredients needed for your recipe, look out for any tools needed such as measuring cups and spoons, bowls, mixers, and pans. Again, baking really is a science; a well- constructed recipe combines specific ingredients in deliberate quantities which, effectively cause expected reactions. 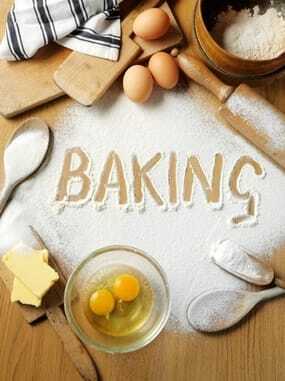 Baking powder or baking soda will cause a reaction that causes baked goods to rise. Eggs, or suitable substitutions such as applesauce, flax meal, or apple sauce in particular quantities, will cause the ingredients to bind together. Even the most divine recipe that has been handed down over generations will turn into a mess if it sticks to the pan! Your recipe will likely guide you to grease your pans (using a non-stick spray, butter, or oil) which will ensure that your cake and baked goods transfer from pan to decorative serving dish without the blink of an eye. The last thing you will want to do is chip your cake away from the sides of the dish and be left with a crumbled mess so don’t scrimp on this step even if you have an aversion to the added fat (just use a natural, fat free spray). Preheating the oven is an important step in any cooking process but it vital in baking. Part of the science behind baking includes the amount of time needed to cook. Under baking leads to an inedible mess, and overcooking has much the same result. There is little room for guess working baking (cooking can be a little more forgiving). 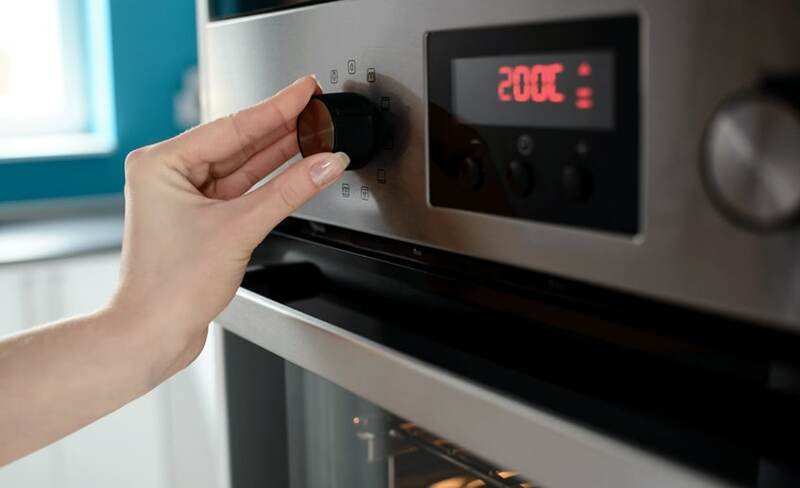 Although baking times may vary due to altitude and a few other factors (the oven itself and material of baking dish, for example) the baking time specified within the recipe is based on the oven being at a particular temperature. 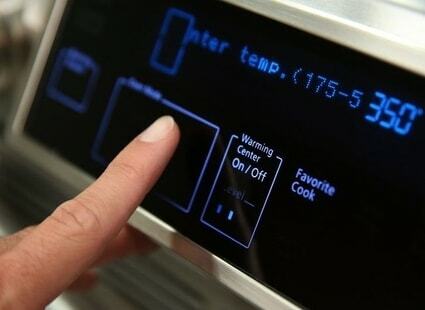 Pre-heating (switching on the oven at the beginning of the process) allows the oven to reach that peak temperature, as called for by the recipe. If your mixture and the baking pan are put in the oven before the temperature reaches that called for, baking times will be impossible to figure out. As you read through your recipe you will also come to see that dry ingredients and liquid components are initially mixed in separate bowls. If you are thinking this step is a waste of time or just a ploy to have you wash more dishes, then don’t! This is another critical step in the process (so accept the fact that you will have an extra bowl at clean up time). Use a sieve to sift the dry ingredients such as flour, baking powder/soda, sugar, salt, and spices (such as cinnamon or cocoa powder). By sifting the flour (which makes for a lighter flour) you will find that the other dry ingredients mix together more thoroughly. Properly combining the dry ingredients before mixing the wet ingredients is also crucial because it cuts down on the number of times the flour is stirred after it becomes wet. 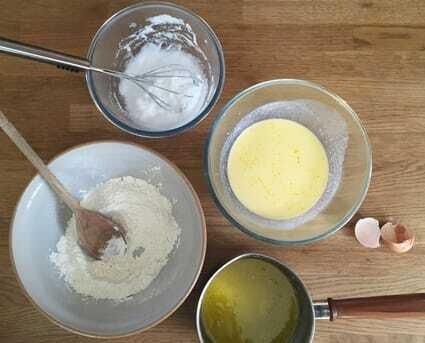 The more worked (stirred/beaten) the wet flour is (think excessive kneading when making bread which deliberately promotes gluten formation) the more your mixture will form elastic gluten strands which will mean a compact, tough texture for your cake. Gluten-free diets aside; gluten is great for bread making (and okay for cookies) but is a no-no for baking cakes, muffins, and other fluffy baked goods. The bottom line is, keep your wet and dry ingredients separate until they are both properly combined in their respective bowls. In one bowl you have all of the dry ingredients such as flour, sugar, salt, spices, and baking powder or soda. In a separate bowl you will combine all of the wet ingredients such as water, milk, oil, and vanilla. So where do the eggs go? Shouldn’t they be in the bowl of wet ingredients? Yes in the sense that eggs are wet and can be readily whisked with similar ingredients but they should first be cracked into a separate bowl. The reason for separating the eggs initially is because there may be something wrong with the egg. Imagine combining all the wet ingredients listed above and then adding the egg. As you crack the egg open and it plops into the rest of the ingredients you realize it is not fresh, or has a spot in it (or worse) and then the whole bowl of partially mixed ingredients needs to be thrown out. 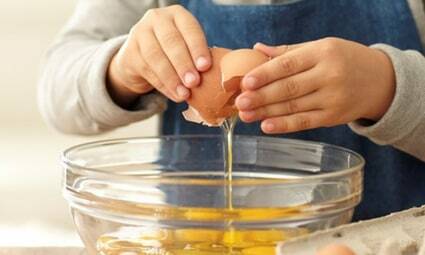 Plus, it’s easier to fish out random bits of egg shell that may have accidentally dropped into your batter! Once the eggs have been whisked and added to the wet ingredients you can now (finally) combine the batter and watch the science take over! Start by digging a hole in the center of the dry ingredients, like the crater of a volcano. Slowly pour the wet components into the hole. Stir all together (a spatula is great for getting everything off the sides of the bowl) but don’t over mix (see Point 4 above). 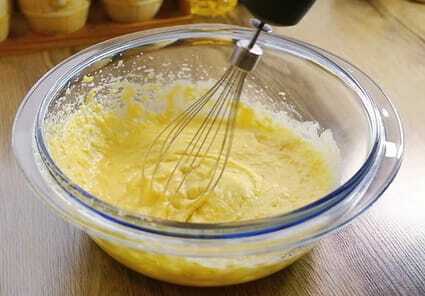 Stir about 16 times or just until all the ingredients are combined (in other words, the batter is uniform). Step #7 – Oven time! 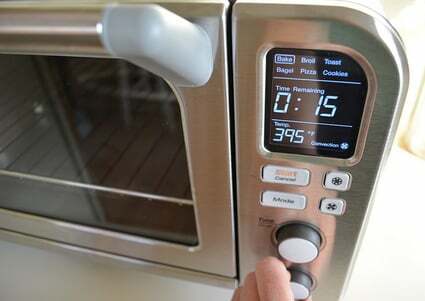 You may have noticed that the oven times given in your recipe are approximate values; say, between 18-20 minutes or maybe 25-30 minutes, or some other time period. 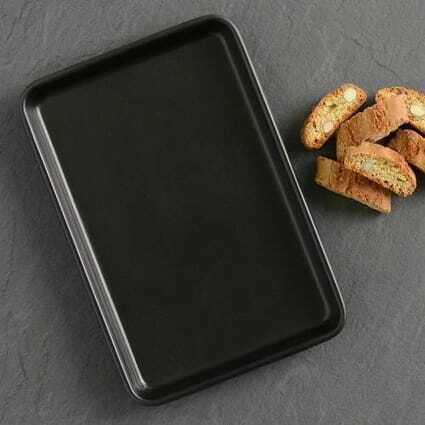 There are several reasons for this, such as altitude, slight difference in ovens, size and depth of baking pan, and the type of baking container used (dark or light colored metal or glass baking dish). Each factor has an effect on the baking times. On a side note, some bread machines such as the Zojirushi Bread Machine explicitly tell you to compensate ingredients when baking in high altitude. Because of the variance in temperature, be sure to keep an eye on your baking. Removing the pan from the oven too early will result in an under cooked cake and an overcooked baked good is not any more appetizing. To find the “sweet spot” (pun intended) set a timer (from experience, always set a timer, never rely on memory). 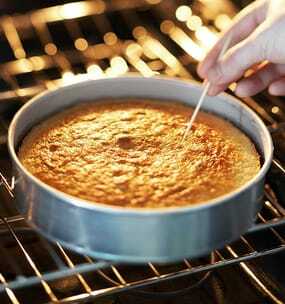 Use a tooth pick, clean cooking skewer or even a dry knife to poke straight through the middle of the cake. If the clean and dry tooth pick comes out clean, your cake is ready. If there are crumbs stuck to the object, leave the batter in the oven for just a few more minutes. Step #8 – Chill out dude! So your cake is done! The tooth pick came out clean and now your cake is sitting on the kitchen counter. Restrain yourself from digging right in, but you knew that right? Did you also know that you shouldn’t try to remove a freshly baked cake from the pan at all for at least 10 minutes? Resist the urge to turn the pan over and scrape away the fragile edges in an attempt to lure the cake out! 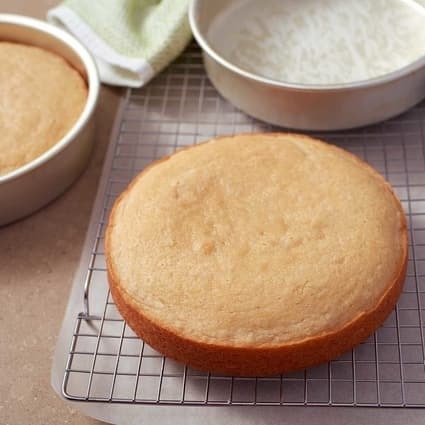 A fresh cake is a soft cake and it will not come out of the pan without a struggle (again, this is said from experience). Also, a warm cake will sink and mold itself into the wire rack while it cools, making for a disastrous, albeit delicious, mess of baking before you are finished. So take your baking out of the oven, let it cool, and take a break. You deserve it! Once your baking has completely cooled, you may start to feel a little imaginative. What’s a cake without icing anyway? Decorating can be a simple process, if you are content with slathering a store bought can of icing on your cake and calling it a day. If you are more adventurous, why not try to be creative and decorate your cake? After all, you just baked your cake from scratch! If you are worried that it will look unpolished, unprofessional, or lack flair and creativity (we can thank the Cake Boss and Cupcake Wars for that); don’t! Like every other skill that you have ever dared to learn (walking, writing, and bike riding) all it takes is determination and practice (a lot of practice). 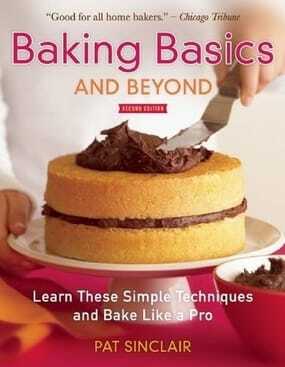 If you are serious about developing your skills as a budding baker, consider purchasing a great beginners book, such as Baking Basics and Beyond: Learn These Simple Techniques and Bake Like a Pro which is filled with straightforward recipes and tips. It’s a fantastic cookbook with outstanding reviews; even if you are more experienced at baking you will likely pick up some great advice; including why different flours are better for different baked goods. This book is a fantastic investment. Cake decorating itself is a true art form; and where the “art” of baking collides with the “science” of the recipe. So now you’ve brushed up on your cake baking and decorating skills, it’s time to invest in the tools of the trade such as piping bags, various sized nozzles, a coupler, and a brush. 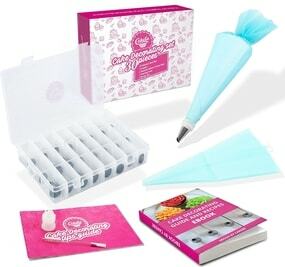 This 30-piece Cake Decorating Kit is an excellent set to start off with; it will help you to learn all the proper techniques such as drawing roses and other flowers. It’s a simple, affordable set that works well with kids and adults alike! Once you have tried your hand at decorating for a while and think it’s something that you will be doing even more of in the future, you might want to upgrade your set. For example, you will need a reusable bag, and additional tips (stainless steel piping/dispenser nozzles will last longer). 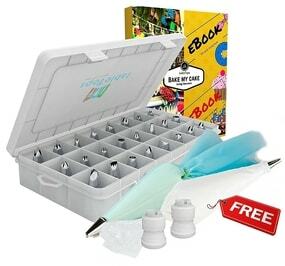 This 37-piece tool, storage, and ebook set are still in an affordable range and will help you increase your skills. In the end, learning how to bake is a fun hobby that has a steep learning curve but one that promises a whole lot of (delicious) fun!